« Happy 5 Aben Maler! The Cambridge Film Festival is on at the moment and last night I attended one of its main events — a live interview with director Stephen Frears, followed by a screening of his latest film Tamara Drewe, adapted from the graphic novel by Posey Simmonds. It was a good time — Frears mixed self-deprecation and common sense in his short but thoughtful answers to the questions posed and shared a number of fine insights on filmmaking. Particularly interesting was his observation of Hollywood filmmaking as a cinema of close-ups, something he realised on the set of Dangeours Liasons (1988). He explained how he had initially planned the film to include a number of full shot longtakes à la Max Ophüls, but decided against it once he realised the actors we much more proficient in close-ups. He also described John Malkovich as completely unschooled, which drew laughs. He very much confirmed the impression left by his films: a director of solid middle-of-the-road films with a certain social involvement; an inspired caster and director of actors attentive to good scripts, but without much vision as a film director. He described the art of adaptation as that of achieving a general fidelity, not a literal one, saying that he strove to avoid going against the spirit of the source. 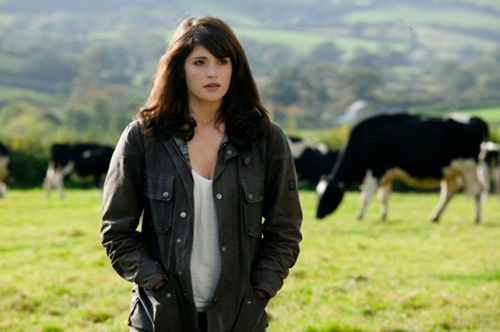 In the case of Tamara Drewe, he further noted that he thought Moira Buffini’s adaptation of the graphic novel was ‘an improvement.’ Watching the film, however, it was hard to find justification for these statements. Basically he and Buffini have turned Simmonds caustic social satire into a largely feelgood comedy, introducing romance where there should be none, exchanging her troubled Wessex idyll for soft-focus Dorset fairyland, and rewriting her perceptive dialogue to stilting effect. Most critically, they have softened radically the story’s denoument, essentially neutering the force of Simmonds pessimism and social critique, while keeping just enough of it to destabilise the film’s otherwise delightfully executed comedy. It’s by no means unwatchable–the actors are almost uniformly excellent, despite the script–and its all very professionally done, but it essentially it reduces an affecting, trenchant work to a piece of inconsequential fluff. Above: Gemma Arterton is excellent as the title character.